Boender Site – French-Reneker-Associates, Inc. The Boender site was a 12-acre site located in Mahaska County. 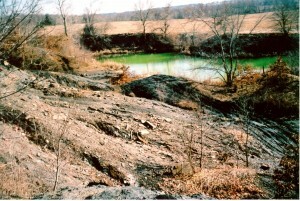 The site included a pond that was in fairly good condition. The landowner wanted to keep the pond for fishing and as a source for irrigation. The project included 56,000 cubic yards of excavation. Terraces and a grassed waterway were constructed to control erosion. A riprap chute was used to outlet the grassed waterway. Soon after the construction, large rains caused erosion in the waterway and along the side of the riprap chute. We worked with your staff to resolve the erosion problems. The site is now performing very well. Cattails are growing around the edges of the pond providing a buffer. The waterway, riprap chute and terraces are all performing well. There are some bare areas without vegetation. The landowner needs to apply lime, fertilizer, and seed to maintain the site.